I am in the process of designing a complete aquatic turtle habitat for my two red-eared sliders, whom I’ve adopted from my sister. They were originally given to her from her boyfriend when they were mere hatchlings, not so different from the ones you usually see at the pet store (which are illegal, by the way, as turtles less than 4″ in length cannot be sold because of their potential harbor salmonella). They are about 10 years old now and have been living in a 20 gallon Aquatic Turtle kit tank from R-Zilla (I know, undersized). This is a long overdue project. Once completed, their 20 gallon tank will be transferred to a different area of the home and use to house two Russian tortoises I’ve just acquired. Right now they are being quarantined in a makeshift tub (sorry little guys, just a little longer). A later project in the timeline will involve creating a full habitat for the Russian tortoises, complete with 3D background and decor that will mimick their natural habitat. The project probably won’t even start until I’ve graduated from Cal Poly Pomona, from late Winter to mid Spring 2012. Back to the aquatic turtle habitat project; it is currently in the design stage where I will be planning out the setup, the filtration system, landscaping and budget. In the following weeks, I’ll have an estimate of the total budget along with a concept drawing of the turtlescape I wish to achieve. I am estimating the whole redesigned habitat will be within the range of $800 after all is said and done and the project will not be completed until February 2012 due to time constraints. Tank: For the new tank, I will be upgrading their dinky 20 gallon tank to a 120 gallon tank that measures 48″L x 24″W x 24″H. I believe this size is perfect for two red-eared sliders. The tank will be coupled with a custom built (or premade) stand and canopy set in stained black finish. A hose will be overlaid somewhere along the upper perimeter of the 3D background and connected to the main oulet from the sump (more below) to activate a waterfall. The canopy will also be decorated with a combination of fake and real plants to conceal unsightly wires, pipings and hoses and to enhance the landscape. Substrate: Polished riverbed rocks will litter the floorbed of the tank while larger rock plates and slats will form the basking area. To distribute the weight evenly, the substrate and rocks will be laid ontop of a complementing 48″x24″ fluorescent grating, which will be raised about 1-2 inches above the tank’s lower panel with PVC pipes to provide enough space for sufficient under-substrate circulation. Lighting: The lighting will be supplemented by an Exo-Terra 48″ Repti-Glo 5.0 linear UVB bulb, a 50w Exo-Terra basking bulb and a 50w Exo-Terra Night Glo bulb. Both the basking bulb and linear UVB bulb will be cycled on for 12 hours using a Zoo-Med AquaSun Timer and powerstrip. The Night Glo bulb will provide nighttime warmth as well as light for nighttime viewing. I am currently using the Aqueon QuietFlow 20 filtration system that was included with the R-Zilla Aquatic Turtle Starter Kit. It is an effective filter for smaller or younger turtles. As they are now, the red-eared sliders have outgrown the efficacy of this filter, so I need to design a more efficient and powerful system to handle their size as well as the new tank capacity. For the new setup, I’m going for a complete wet/dry sump filter setup with an external planted refugium to compliment the system. The refugium will be fully planted with several varieties of aquatic plants to balance the pH level and to oxygenate the water. I’m thinking of keeping feeder goldfish in the refugium as food source for the turtle, but I’ll see how that turns out. Ghost shrimps will be added to clean the floorbed of the refugium. A heater will also be added to the refugium to heat the water to a comfortable 75-degree level, not only to promote plant growth but also to heat up the main tank with the turtles in it. 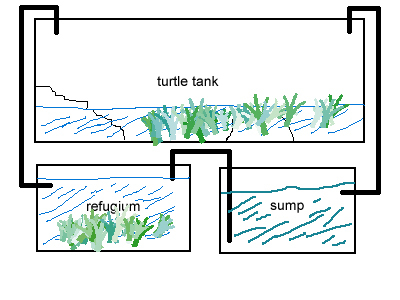 Rough sketch of what the new turtle habitat system is envisioned to look like. The empty cavern behind the Aquaterra 3D background will serve as the cavity for the overflow. 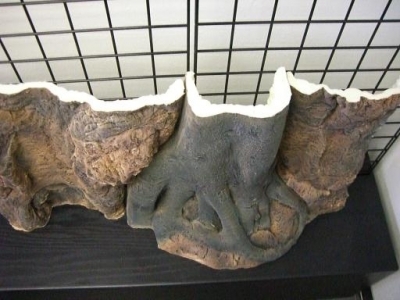 A 1″ diameter hole will be drilled through the background and patched with a piece of gutter guard to provide a seemless flow of water from the main tank to the overflow, which then gets picked up by another pipe and siphon into the sump below.